Since 1973, Rideable Bicycle Replicas has been turning out our spoked behemoths, using materials and techniques largely unchanged from those employed in the late nineteenth century. To ride one of our bicycles is like taking a trip back to another era--to a time when things were slower, but a lot more pleasant. Purchased by Mel Barron in 1973, and currently owned and operated by Greg Barron, RBR first began manufacturing standard and antique replica bicycles during the great bicycle boom of the 1970's. When the boom ended, we continued to make the bikes we enjoyed riding the most: the hiwheelers (also known as Penny Farthings). 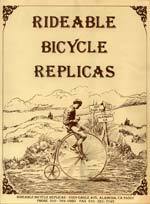 Rideable Bicycle Replicas was originally based in Cleveland, then moved Columbus, Ohio. Later heading out to the West Coast, we relocated to Oakland, California, and finally settled in Alameda, California in 1987. With a few skilled craftsmen, we have continued to produce about 200 hiwheelers a year. 'Boneshaker' is the trade name for our hiwheeler. The original Boneshaker was a wooden and steel bicycle built in the mid 1800s. Our Boneshaker was the hit of several bicycle shows in Miami, New York, Palm Springs, and Cologne, Germany. All of our cycles are designed to provide maximum strength while keeping the original antique look. When riding our bicycles over very rough surfaces, the first thing to give out won't be the bike. It can be an interesting ride indeed. All of our bicycles have rubber tires, of course. See the tire install page for more information. If you're wondering how to mount up on these monster bikes for a ride, the technique is a bit tricky. There is a pedal over the rear wheel from which you use to push off with a running start. It doesn't take to long to master. See the riding instructions page for tips on getting started. For examples of how to transport your bike, see How to Transport a Hiwheel. Looking for safety features? Your height above the ground makes you visible in traffic. Very visible. People will often smile and wave as you pass by. Over the years we have sold our hiwheelers all over the world, to some very notable customers, including: Ringling Brothers and Barnum & Bailey Circus, David Copperfield, a Swiss bicycle racing team, and Walt Disney, just to name a few. Even the Sultan of Oman bought five of our bikes for a national sports festival. The bikes are very popular at festivals, parades, and shows. If you see hiwheelers on TV or in films, they are more than likely manufactured by us here at Rideable Bicycle Replicas. In 2008, Rideable Bicycle Replicas received the "Best of Alameda" award from the U.S. Local Business Association. See more awards and articles about RBR on our "In the Press" page.